I’ve had a pretty good week on the choir front. 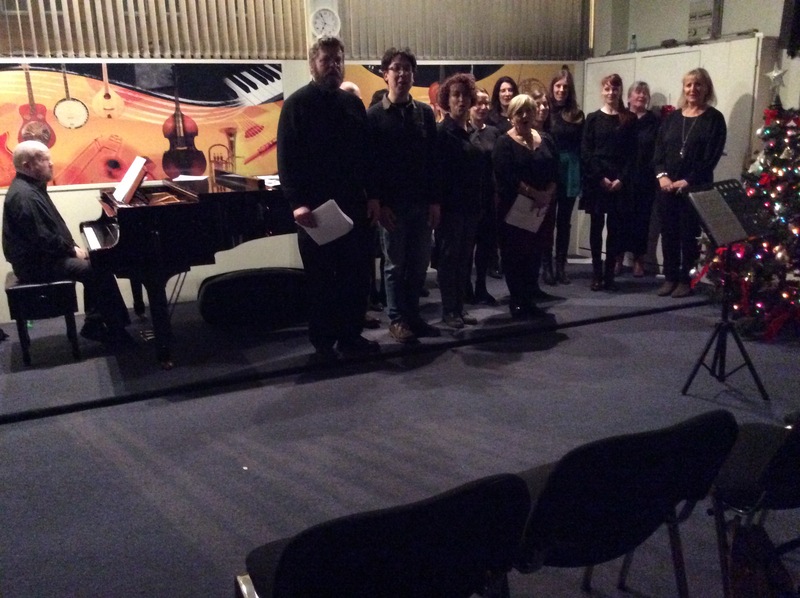 Sandymount Gospel Choir were shortlisted for Lyric FM‘s Choirs for Christmas competition, with our version of Light of the Stable by Emmylou Harris airing on Niall Carroll’s show on Wednesday 10th December. We had a cracking concert with Portmarnock Singers on Sunday 10th in St. Anne’s Church in Portmarnock, the culmination of a tough season’s rehearsing. And the Waltons Sing Your Heart Out Choir gave their end of term concert last Thursday 4th, also a great success (that’s them in the rather dark photograph below…….luckily I’m much better at conducting choirs than at taking photos of them!) Meanwhile in The Gospel Project we had the somewhat unusual experience last Friday 5th December of performing in a warehouse in West Dublin…..have we had a career change, I hear you ask? Well, no, but it was certainly a little different to our usual weddings & functions; a retirement send-off for two obviously very popular figures in Kefron, both stepping down after having established the company and given it lifelong service. We sang a (somewhat altered!) version of Aloe Blac’s The Man in honour of Tom & Mick. The period from September-Christmas can be a bit frantic for choir directors, and I’ll admit that this year in particular it was taking its toll on my energies during the rehearsal period, but as a choir member said to me this week, ‘it’s reward time now’. It’s all paid off. A good term’s work.